Pictured with OUC Clerk Karen Pervical, club head coach Vicki Pritchard gratefully received the cheque which is already earmarked for two competition-spec trampolines. The new top-of-the-line trampolines will be used by the Flyers competitive trampoline squad and by the juniors’ section which can now be expanded to create a larger, four-bed session. A further sixty places can now be offered across the club’s sessions at Parklands Leisure Centre for those on the extensive club waiting list. 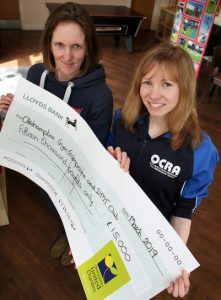 The initial grant application was for a smaller amount, aiming at buying one new and one second-hand trampoline; however, on reviewing the costings contained in the application, OUC generously made up the difference to buy the second trampoline new, in a gesture which was appreciated by the club members in their ‘thank you’ card to OUC. The trampolines are due to arrive from Germany during the Easter Holidays. For any membership enquiries, please contact vicki@ocrasport.org.uk, or see the club website for details of sessions and fees.